similar interests and priorities. Whether the shared passion is golf, tennis, trail hiking, wildlife preservation, or raising a young family, the underlying desire is for a communal sense of safety and security. Homeowners Associations have increasingly turned to the use of concrete security, boundary, and privacy fences in recent years. The advantages are plentiful, whether the living environment is a gated or non-gated community, a townhouse development, condominiums, or an apartment complex. Systems so very attractive, and the premier precast fence forming system in the marketplace. Security fences have two main purposes: safety and protection. In a community with gated entrances, the number of people to whom access is granted is monitored, thus a gated community discourages peddlers, loiterers, and litterers. More importantly, criminal activity is reduced. Additional security can be added by the use of lighting set atop a fence. StoneTree® Concrete Fence Wall System columns are amenable to the wiring required. Surveillance cameras can be installed at the entrance. Security boundary walls are often used to enclose areas that endanger children or pets, such as swimming pools. Decorative walls can be used to demarcate shared resources, such as dog parks and communal organic gardens. Noise pollution is not only distracting and annoying, it can be a health hazard. Hearing loss, stress, increased blood pressure, and sleep disturbances can all result from constant exposure to environmental noises. HOA Community fences protect residents from noisy neighbors, barking dogs, or adjacent, highly trafficked roads. StoneTree® Concrete Fence Wall System wall sections are manufactured using high strength concrete, providing thickness and density, working effectively as a reflective sound barrier.The result is a significant reduction in sound waves traveling past the wall through gaps and openings of stacked panels, effectively decreasing noise pollution. Both sides of the wall can be textured as slate, stucco, stone, or a custom design providing an attractive view from every angle. Instead of a functional eyesore, homeowners enjoy an architectural eye-and-ear-pleaser. Many more textures & colors available! StoneTree® Concrete Fence Wall System precast concrete fences are completely solid to ensure that you can retreat to your yard in full privacy. They offer attractive screens to block out views of streets, vehicles, or neighbor windows. In addition, privacy fences establish boundary lines between neighbors, which is advantageous for periods of restful solitude and isolation, which are sometimes lacking in close communal settings. A variety of looks and heights are available for your privacy fence, ensuring not only down time when you desire it, but also the sound barrier features. Hardscape privacy fences are easily installed and require little maintenance. “Concrete wall” might not sound very aesthetically appealing, but nothing is further from the truth. Concrete walls that were once drab and plain can now be organically integrated into the natural landscape with textures and patterns bearing the appearance of natural stone, slate, split face block, stucco, brick, https://www.acheterviagrafr24.com/generic-viagra/ and river rock. StoneTree® Concrete Fence Wall System panels are cast with an architecturally designed pattern and texture on both sides, creating an attractive, aesthetically pleasing façade with an attractive view from every angle. 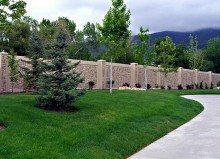 StoneTree® Concrete Fence Wall Systems are available in standard heights of 3, 6, 8, 10, and 12 feet. Combination low wall/ high column concrete fence forms are available to add decorative accents such as wrought iron. For large projects, casting may be performed onsite, saving transportation and handling costs and increasing efficiency. Because of its remarkably durable qualities, precast concrete makes an ideal outdoor building material. The StoneTree® Concrete Fence Wall Systems outlast block, stucco, wood, wrought iron, and any other type of fence or wall. Nothing outlasts this product, in either mild or severe climates. While other materials rapidly deteriorate in extremes of weather, environment, and temperature, a precast concrete fence endures with little maintenance. The StoneTree® Concrete Fence Wall Systems have been designed to withstand 90 mph winds as well as hurricane conditions of 150 mph for regions such as Florida, Mississippi, Louisiana, the Carolinas, and Texas. The walls are designed for local seismic forces. Footing Support System also ensures fences will not be susceptible to expansive soil conditions, impact on existing landscapes will be minimal, and there will be no damage from water or ice. 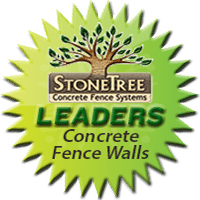 StoneTree® Concrete Fence Wall Systems guarantee the most efficient installation in the industry. Clients enjoy a large savings in labor because projects are completed faster. The efficiently designed footing systems eliminate the requirements of footing cages, temporary bracing, and column grouting. The precast boundary wall panel and column unit is lifted and set into place and requires no additional labor or adjustments. The wall can be constructed as quickly as the panel and column units can be lifted into place. For example, installing a 6-feet high concrete fence involves a crew of three, including an experienced construction foreman, who manufacture on the jobsite. StoneTree® Concrete Fence Wall Systems crew can install an average of 90 lineal feet of fence per day, including the footings, with one forming system. Homeowner Association Fence Walls from StoneTree® Concrete Fence Wall Systems provide privacy, security, and the long-lasting, maintenance-free upper class allure that drives residency and increases home values, quality of life, and peace of mind! For more information on StoneTree® HOA Security Fences, contacts us. Call (866) 370-3676 or click today!